FAYETTEVILLE, Ark. – An announced crowd of 5,142 were in attendance Friday night at Baum Stadium as the Arkansas baseball team took on Wichita State in its first fall exhibition of 2018. Arkansas ended up winning the game, 10-1, over 14 innings as fans got a first-hand look at many veterans and newcomers alike. Sophomore Heston Kjerstad, who is coming off an All-American and SEC Freshman of the Year campaign, went 1-for-5 in the opening nine innings. His lone hit was a two-run opposite-field home run in the first inning that got Arkansas’ offense going. 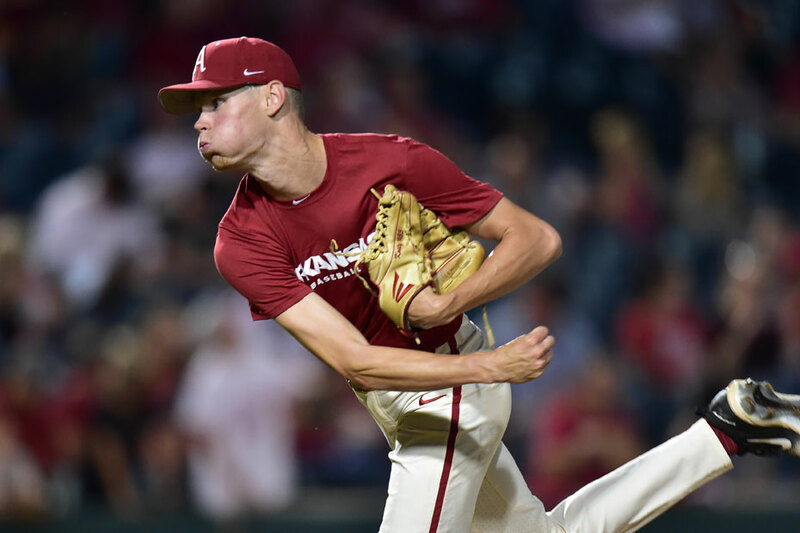 On the mound, Arkansas’ pitching staff excelled, allowing only one run on five hits throughout the entire night. Redshirt junior right-hander Isaiah Campbell got the start and battled through a shaky first inning to strike out eight over four innings. He only walked one batter and threw 63 pitches, retiring four of the last five he faced. For the next five innings, the Arkansas coaching staff worked its pitchers as if it were a real game. With a 2-0 lead after the first, junior Jacob Kostyshock threw two perfect innings, striking out three. Then, redshirt junior Cody Scroggins threw a perfect seventh inning, followed by a perfect eighth by sophomore Kole Ramage. With the score 3-1 going into the ninth, junior lefty Matt Cronin got his number called to close out the game. Cronin, who set the Arkansas single-season record for saves (14) last year, did what he does best, striking out the side in the ninth on 12 pitches. Arkansas added five more runs in the 10th as its starting lineup got one more turn at the plate before giving way to the bench. Sophomore JUCO transfer Matt Goodheart turned in a good day at the plate, going 2-for-5 including a long home run over the right field bullpen. He finished with four RBIs in the game. The Razorbacks will continue with fall practice next week before playing its final fall exhibition on Friday, Oct. 12 against the Little Rock Trojans. The team will travel to the capital city and play at Gary Hogan Field. First pitch is scheduled for 4:30 p.m.